I’m an adventure addict. I love to travel and push out of my comfort zone. I’ve bungee jumped, ran a marathon, and started a business. I’m always looking for challenges so I can overcome them. Particularly if they scare me. Writing fiction, soliciting reviews, opening myself up to criticism? That’s the current challenge! I’ve always written. I won a writing award in first grade when I could hardly hold a pencil. It was a gruesome little story for a six year old. It followed a litter of kittens escaping being drowned by a farmer and striking out to find their new homes. I illustrated it with crayons. Thankfully I no longer illustrate my own books! 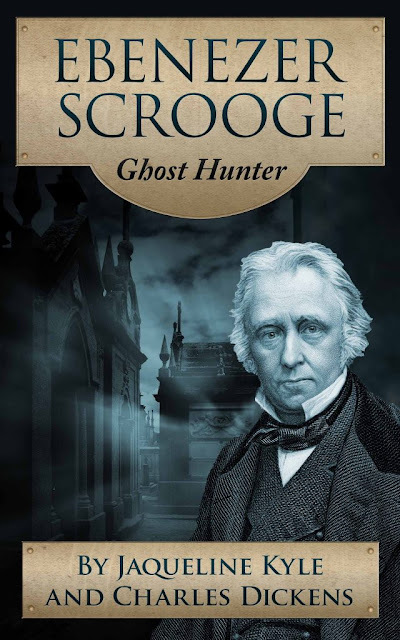 It’s called Ebenezer Scrooge: Ghost Hunter and it’s a retelling of A Christmas Carol. The story is still about redemption, but Scrooge has different motivations and social hang ups. Plus there’s scary supernatural stuff. It was a delightful project because there are so many ghosts and creepy things in the original text! I think most readers will have trouble picking out where Dickens’ prose ends and mine begins. I was wandering around a Dickens Fair (like a Renaissance Fair but set in the streets of London circa 1850). They were performing scenes from A Christmas Carol out in the crowd. When the Ghost of Christmas Yet to Come appeared, a woman was blocking the path for the performer, so he stood silent as death behind her. When someone finally nudged her, she turned and screamed bloody murder. It was fantastic. I went home thinking that A Christmas Carol was still very relevant today. The Ghost of Christmas Present is particularly sinister. He was the most challenging to write because in the original, he’s jovial and almost carefree. Re-reading the book now, he’s definitely become my favorite. Retelling a beloved classic has peculiar challenges. How do you respect the characters and original author, but bring something new to the table? It’s rather presumptive to re-write Dickens – he’s amazing. I overcame the issue by sticking with the original style of tone and prose. That way the new content surprises and delights the reader and respects the legacy. To write a good story. Writing makes me ridiculously happy. If I can tell a good story that other people enjoy, it just completes this circle of happiness. I started a community for aspiring writers and indie authors called Wordingly. I’ve spent the majority of my time lately creating how-to manuals and video tutorials for everything from ebook layout to marketing techniques. There’s such a learning curve when you’re trying to get your first book out. Wordingly is a collection of courses, best practices and community to help tear down that barrier. Write the best story that you can. Most aspiring writers get scared of what people will think. They panic and stop writing. They self-sabotage the publishing process. Embrace the fear and do it anyway!